Urology cancer diagnosis and treatment: more than 10,000 cases. Performed many of the world’s and Taiwan’s first robotic arm surgeries. More than 200 medical papers have been published, one of which won the world’s first prize in the 2012 British Journal of Urology. Experience in treating patients from more than 20 countries. B.A., M.D. National Defense Medical College, Taipei, Taiwan. 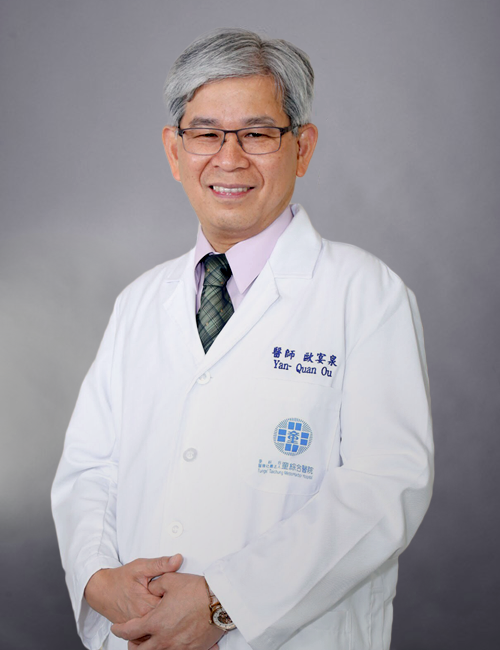 Ph.D. Chung Sang Medical University, Institute of Medicine,Taichung, Taiwan. Ou YC, Li JR, Wang JD, Chen WY, Kuan YH, Yang CP, Liao SL, Lu HC, Chen CJ. Wei-Chun Weng, Li-Hua Huang, Chao-Yu Hsu, Min-Che Tung, Cheng-Kuang Yang, Jong-Shiaw Jin, Yen-Chuan Ou, Shun-Fa Yang. Impact of prostatic anterior fat pads with lymph node staging in prostate cancer. Journal of Cancer. 2018; 9(18): 3361-3365. doi: 10.7150/jca.25554. Min -Che Tung, Yen Chuan Ou, Li-Hua Huang, Wei-Chun Weng, Kuangh-Si Chang, Chao-Yu Shu,Yi-Sheng Lin. Broader application in robotic urologic surgery. Under review. Yen-Chuan Ou and Hung-Lin Chen. Immunotherapy in Prostate Cancer: Past, Current, and Future. Tungs’ Medical Journal 2018, 12:1-5. Wang BR, Chen CC, Zheng RH, Hu JC, Ou YC. Comparison of cancer detection between 18- and 12-core prostate biopsy in Asian patients with prostate-specific antigen levels of 4-20 ng/mL. J Chin Med Assoc. 2018 Aug 9. pii: S1726-4901(18)30192-8. Hussain M, Fizazi K, Saad F, Rathenborg P, Shore N, Ferreira U, Ivashchenko P, Demirhan E, Modelska K, Phung, Krivoshik A, Sternberg CN. PROSPER Investigators. Enzalutamide in Men with Nonmetastatic, Castration-Resistant Prostate Cancer. N Engl J Med. 2018 Jun 28;378(26):2465-2474. Smith MR, Saad F, Chowdhury S, Oudard S, Hadaschik BA, Graff JN, Olmos D, Mainwaring PN, Lee JY, Uemura H, Lopez-Gitlitz A, Trudel GC, Espina BM, Shu Y, Park YC, Rackoff WR, Yu MK, Small EJ; SPARTAN Investigators. Apalutamide Treatment and Metastasis-free Survival in Prostate Cancer. N Engl J Med. 2018 Apr 12;378(15):1408-1418. Wang SC, Chen CC, Yang CK, Hung SW, Jan YJ, Ou YC*. Pathological outcomes in men with prostate cancer who are eligible for active surveillance. J Chin Med Assoc. 2018 Apr;81(4):348-351. Gu-Shun Lai, Min-Che Tung , Chun-Kuang Yang, Ju-Chuan Hu, Jen-Hao Cheng, Sheng-Chun Hung, Siu-Wan Hung, Yen-Chuan Ou* Oncologic Outcomes of Robot-Assisted Laparoscopic Nephrouretectomy in Treating Upper Urinary Tract Urothelial Carcinoma. World Journal of Urology 2017 under review. Hung SC, Yang CK, Cheng CL, Ou YC. Long-term Oncologic Outcomes of Robotic-assisted Radical Prostatectomy by a Single Surgeon. Anticancer Res. 2017 Aug;37(8):4157-4164. Chang CY, Li JR, Ou YC, Lin SY, Wang YY, Chen WY, Hu YH, Lai CY, Chang CJ, Chen CJ. Interplay of inflammatory gene expression in pericytes following Japanese encephalitis virus infection. Brain Behav Immun. 2017 Jul 6. pii: S0889-1591(17)30210-6. Petrylak DP, de Wit R, Chi KN, Drakaki A, Sternberg CN, Nishiyama H, Castellano D, Hussain S, Fléchon A, Bamias A, Yu EY, van der Heijden MS, Matsubara N, Alekseev B, Necchi A, Géczi L, Ou YC, Coskun HS, Su WP, Hegemann M, Percent IJ, Lee JL, Tucci M, Semenov A, Laestadius F, Peer A, Tortora G, Safina S, Del Muro XG, Rodriguez-Vida A, Cicin I, Harputluoglu H, Widau RC, Liepa AM, Walgren RA, Hamid O, Zimmermann AH, Bell-McGuinn KM, Powles T; RANGE study investigators. Ramucirumab plus docetaxel versus placebo plus docetaxel in patients with locally advanced or metastatic urothelial carcinoma after platinum-based therapy (RANGE): a randomised, double-blind, phase 3 trial. Lancet. 2017 Sep 12. pii: S0140-6736(17)32365-6. doi: 10.1016/S0140-6736(17)32365-6. Hu JC, Hung SC, Ou YC*. Assessments of Neoadjuvant Hormone Therapy Followed by Robotic-Assisted Radical Prostatectomy for Intermediate- and High-Risk Prostate Cancer. Yuan SY, Shiau MY, Ou YC, Huang YC, Chen CC, Cheng CL, Chiu KY, Wang SS, Tsai KJ. Miconazole induces apoptosis via the death receptor 5-dependent and mitochondrial-mediated pathways in human bladder cancer cells. Hung SC, Chiu KY, Cheng CL, Ou YC, Ho HC, Wang SS, Chen CS, Li JR, Yang CK, Chang LW. Ureteroscopy-Assisted Laparoscopic Segmental Resection of Ureteral Stricture with a Modified Flank Position: Clinical Experience. J Laparoendosc Adv Surg Tech A. 2017 Apr 12. doi: 10.1089/lap.2016.0632. Ou YC, Hung SC, Hwang LH, Yang CK, Hung SW, Tung MC. Salvage Robotic-assisted Laparoscopic Radical Prostatectomy: Experience with 14 Cases.Anticancer Res. 2017 Apr;37(4):2045-2050. Hung SC, Wang SS, Yang CK, Li JR, Cheng CL, Ou YC, Ho HC, Chiu KY, Chen CS. Comparison of Efficacy of Adjuvant MEC (Methotrexate, Epirubicin and Cisplatin) and GC (Gemcitabine and Cisplatin) in Advanced Upper Tract Urothelial Carcinoma. Anticancer Res. 2017 Apr;37(4):1875-1883. Yuan SY, Cheng CL, Wang SS, Ho HC, Chiu KY, Chen CS, Chen CC, Shiau MY, Ou YC. Escin induces apoptosis in human renal cancer cells through G2/M arrest and reactive oxygen species-modulated mitochondrial pathways. Oncol Rep. 2017 Feb;37(2):1002-1010. Li JR, Wu CC, Chang CY, Ou YC, Lin SY, Wang YY, Chen WY, Raung SL, Liao SL, Chen CJ. Susceptibility of naïve and differentiated PC12 cells to Japanese encephalitis virus infection. IUBMB Life. 2017 Feb;69(2):79-87. Jian-Ri Li, Chi-rei Yang, Shian-Shiang Wang, Yen-chuan Ou*, Cheng-Kuang Yang, Chuan-Su Chen, Hao-Chung Ho, Kun-yuan Chiu, Chi-feng Hung, Chen-li Cheng, Cheng-che Chen, Shu-chi Wang, Chia-yen Lin. First line androgen deprivation duration is associated with the efficacy outcome of abiraterone acetate treated metastatic castration-resistant prostate cancer after docetaxel. Front Pharmacol. 2017 Feb 13;8:55.
prostatectomy from case 1 to case 1200. Urological Science 2016, Vol.27-199-207. Lin CY, Yang CK, Yen-Chuan Ou *, Chiu KY, Cheng CL, Ho HC, Wang SS, Chen CS, Li JR. Long-term outcome of robotic partial nephrectomy for renal angiomyolipoma. Asian J Surg. 2016 Dec 7. pii: S1015-9584(16)30238-X. doi: 10.1016/j.asjsur.2016.11.003. Ou YC, Weng WC, Chang KS, Mei CE, Yang CK, Hung SW, Wang J, Tung MC. Prophylactic Robotic-assisted Laparoscopic Radical Prostatectomy for Preoperative Suspicion of Prostate Cancer: Experience with 55 Cases. Anticancer Res. 2016 Sep;36(9):4895-901. Tony Wu, Kun-Hung Shen, Chao-Yuan Huang, Yen-Hwa Chang, Po-Hui Chiang, Yen-Chuan Ou, Hsi-Chin Wu, Chih-Shou Chen, See-Tong Pang, Ming-Kuen Lai. Efficacy and Safety Of Degarelix In Taiwanese Patients With Prostate Cancer Requiring Androgen Deprivation Therapy: An Open-Label, Multicenter Phase Iii Study. J Cancer Biol Therap, 2016, 1(2): 82-93. Chi-Feng Hung, Cheng-Kuang Yang , Yen-Chuan Ou*. Urological cancer in Taiwan. Jpn J Clin Oncol. 2016 Jul;46(7):605-9. Chen SL, Huang YH, Hung TW, Ou YC*. Comparison of nocturia response to desmopressin treatment in elderly men with and without nocturnal polyuria in real-life practice. Int J Clin Pract. 2016 May;70(5):372-9. Yen-Chuan Ou, Chun-Kuang Yang, Kuangh-Si Chang, John Wang, Siu-Wan Hung, Min-Che Tung, Ashutosh K. Tewari, Vipul R. Patel. Prevention and management of complications during robotic-assisted laparoscopic radical prostatectomy following comprehensive planning: a large series involving a single surgeon. Anticancer Res 2016; 36(4):1991-8. Tony Wu, Hsi Chin Wu, Yen Chuan Ou, See-Tong Pang, Yeong-Shiau Pu,Yen-Hwa Chang The efficacy of abiraterone acetate in treating Taiwanese chemo-refractory metastatic castration-resistant prostate cancer patients. Urological Science 2015; 1: 1-5. Chang CY, Li JR, Wu CC, Ou YC, Chen WY, Kuan YH, Wang WY, Chen CJ. Valproic acid sensitizes human glioma cells to gefitinib-induced autophagy. Chang CY, Li JR, Ou YC, Chen WY, Liao SL, Raung SL, Hsiao AL, Chen CJ. Enterovirus 71 infection caused neuronal cell death and cytokine expression in cultured rat neural cells. IUBMB Life. 2015 Oct;67(10):789-800. Yuan SY, Cheng CL, Ho HC, Wang SS, Chiu KY, Su CK, Ou YC, Lin CC. Nortriptyline induces mitochondria and death receptor-mediated apoptosis in bladder cancer cells and inhibits bladder tumor growth in vivo. Eur J Pharmacol. 2015 Aug 15;761:309-20. Kwon YS, Ha YS, Modi PK, Salmasi A, Parihar JS, Patel N, Faiena I, May M, Lee DI, Llukani E, Patrick T, Rha KH, Ahlering T, Skarecky D, Ahn H, Choi SK, Park S, Jeon SS, Ou YC, Eun D, Manucha V, Albala D, Badani K, Yuh B, Ruel N, Kim TH, Kwon TG, Marchalik D, Hwang J, Kim WJ, Kim IY. Oncologic outcomes in men with metastasis to the prostatic anterior fat pad lymph nodes: a multi-institution international study. BMC Urol. 2015 Aug 1;15:79. doi: 10.1186/s12894-015-0070-1. Chang CY, Kao TK, Chen WY, Ou YC, Li JR, Liao SL, Raung SL, Chen CJ. Tetramethylpyrazine inhibits neutrophil activation following permanent cerebral ischemia in rats. Biochem Biophys Res Commun. 2015 Jul 31;463(3):421-7. doi: 10.1016/j.bbrc.2015.05.088. Chang CY, Li JR, Chen WY, Ou YC, Lai CY, Hu YH, Wu CC, Chang CJ, Chen CJ. Disruption of in vitro endothelial barrier integrity by Japanese encephalitis virus-Infected astrocytes. Glia. 2015 May 8. doi: 10.1002/glia.22857. Yu CC, Ho HC, Yu TM, Ou YC, Shu KH, Cheng CL, Su CK, Chen WM, Wang SS, Chen CS, Li JR, Yang CK. Kidneys from standard-criteria donors with different severities of terminal acute kidney injury. Transplant Proc. 2014 Dec;46(10):3335-8. doi: 10.1016/j.transproceed.2014.11.002. Ou YC*, Yang CK, Kang HM, Chang KS, Wang J, Hung SW, Tung MC, Tewari AK, Patel VR. Pentafecta Outcomes of 230 Cases of Robotic-assisted Radical Prostatectomy with Bilateral Neurovascular Bundle Preservation. Anticancer Res. 2015 Sep;35(9):5007-13. Gu-Shun Lai , Yang CK, Ou YC*. Robot-assisted nephroureterectomy for upper urinary tract urothelial carcinoma without intraoperative re-position or re-docking. Urological Science 2016, 27:174-6. Ou YC*. Editorial commentary on “Novel technique to enhance bladder neck dissection with traction of Foley catheter during extraperitoneal laparoscopic radical prostatectomy” Journal title: Laparoscopic radical prostatectomy is still a viable option for localized prostate cancer in Asians. Urological Science 2015 Vol. 26, Issue 1, p29–30. Videourodynamic study helps to predict recovery of urinary continence after radical prostatectomy. Urological Science 2015 Vol. 1, pp. 36-37. Tsai SC, Ou YC, Cheng CL, Li JR, Lin YC, Ho HC, Chiu KY, Su CK, Lin WY. Reduction of bladder activity on FDG PET/CT scan in patients with urinary bladder carcinoma. A prospective study with a patient-friendly protocol. Li JR, Yang CK, Wang SS, Chen CS, Chiu KY, Cheng CL, Yang CR, Ho HC, Ko JL, Ou YC*. First-line Treatment Result Influence Second-line Regimen Selection in Targeted Therapy for Metastatic Renal Cell Carcinoma. Kwak C, Wu TT, Lee HM, Wu HC, Hong SJ, Ou YC, Byun SS, Rhim HY, Kheoh T, Wan Y, Yeh H, Yu MK, Kim CS. Abiraterone acetate and prednisolone for metastatic castration-resistant prostate cancer failing androgen deprivation and docetaxel-based chemotherapy: A phase II bridging study in Korean and Taiwanese patients. Int J Urol. 2014 Dec;21(12):1239-44. Yang CK, Chung SD, Hung SF, Wu WC, Ou YC*, Huang CY, Pu YS. Li JR, Cheng CL, Yang WJ, Yang CR, Ou YC*, Wu MJ, Ko JL. FIP-gts potentiate autophagic cell death against cisplatin-resistant urothelial cancer cells. Anticancer Res. 2014 Jun;34(6):2973-83. Chang CY, Kuan YH, Ou YC, Li JR, Wu CC, Pan PH, Chen WY, Huang HY, Chen CJ. Autophagy contributes to gefitinib-induced glioma cell growth inhibition. Exp Cell Res. 2014 Sep 10;327(1):102-12. Wang SS, Hsieh MJ, Ou YC, Chen CS, Li JR, Hsiao PC, Yang SF. Impacts of ICAM-1 gene polymorphisms on urothelial cell carcinoma susceptibility and clinicopathologic characteristics in Taiwan. Tumour Biol. 2014 Aug;35(8):7483-90. Lin CY, Yang CR, Cheng CL, Ho HC, Chiu KY, Su CK, Chen WM, Wang SS, Chen CS, Li JR, Yang CK, Ou YC*. Application in robotic urologic surgery. J Chin Med Assoc. 2014 May;77(5):242-5. Escudier B, Grünwald V, Ravaud A, Ou YC, Castellano D, Lin CC, Gschwend JE, Harzstark A, Beall S, Pirotta N, Squires M, Shi M, Angevin E. Phase II results of Dovitinib (TKI258) in patients with metastatic renal cell cancer. Clin Cancer Res. 2014 Jun 1;20(11):3012-22. Michaelson MD, Oudard S, Ou YC, Sengeløv L, Saad F, Houede N, Ostler P, Stenzl A, Daugaard G, Jones R, Laestadius F, Ullèn A, Bahl A, Castellano D, Gschwend J, Maurina T, Chow Maneval E, Wang SL, Lechuga MJ, Paolini J, Chen I. Randomized, Placebo-Controlled, Phase III Trial of Sunitinib Plus Prednisone Versus Prednisone Alone in Progressive, Metastatic, Castration-Resistant Prostate Cancer. J Clin Oncol. 2014 32(2):76-82. Chen CC, Yang CK, Hung SW, Wang J, Ou YC*. Outcome of vesicourethral anastomosis after robot-assisted laparoscopic radical prostatectomy: A 6-year experience in Taiwan. J Formos Med Assoc. 2014 Jan 31. pii: S0929-6646(14)00002-3. Li-Hua Huang, Siu-Wan Hung, Yen-Chuan Ou, Kun-Yuan Chiu. Nephron-sparing surgery with autotransplantation for high-grade upper urinary tract urothelial carcinoma in a patient with solitary kidney. Urological Science, 2014, Vol. 25, Issue 4, p146–148. Chih-Chin Yu, Yen-Chuan Ou, Hao-Chung Ho, Chen-Li Cheng, Jian-Ri Li. Urological Science, 2015 Vol. 26, Issue 4, p244–249. Chih-Chin Yu, Yen-Chuan Ou, Cheng-Kuang Yang. diversion. Urological Science, Vol. 26, Issue 2, p91–94. Chiang PH, Wang HC, Lai YL, Chen SC, Yen-Hwa W, Kok CK, Ou YC, Huang JS, Huang TC, Chao TY. Zoledronic acid treatment for cancerous bone metastases: a phase IV study in Taiwan. J Cancer Res Ther. 2013 Oct-Dec;9(4):653-9. Wang SS, Liu YF, Ou YC, Chen CS, Li JR, Yang SF. Impacts of CA9 Gene Polymorphisms on Urothelial Cell Carcinoma Susceptibility and Clinicopathologic Characteristics in Taiwan. PLoS One. 2013 Dec 13;8(12):e82804. doi: 10.1371/journal. Oh WK, McDermott D, Porta C, Levy A, Elaidi R, Scotte F, Hawkins R, Castellano D, Bellmunt J, Rha SY, Sun JM, Nathan P, Feinberg BA, Scott J, McDermott R, Ahn JH, Wagstaff J, Chang YH, Ou YC, Donnellan P, Huang CY, McCaffrey J, Chiang PH, Chuang CK, Korves C, Neary MP, Diaz JR, Mehmud F, Duh MS. Angiogenesis inhibitor therapies for advanced renal cell carcinoma: Toxicity and treatment patterns in clinical practice from a global medical chart review. Int J Oncol. 2014 Jan;44(1):5-16. Chen CJ, Ou YC, Li JR, Chang CY, Pan HC, Lai CY, Liao SL, Raung SL, Chang CJ. Infection of pericytes in vitro by Japanese encephalitis virus disrupts the integrity of endothelial barrier. J Virol. 2014 Jan;88(2):1150-61. Chang CY, Kuan YH, Li JR, Chen WY, Ou YC, Pan HC, Liao SL, Raung SL, Chang CJ, Chen CJ. Docosahexaenoic acid reduces cellular inflammatory response following permanent focal cerebral ischemia in rats. J Nutr Biochem. 2013 Dec;24(12):2127-37. Kim IY, Modi PK, Sadimin E, Ha YS, Kim JH, Skarecky D, Cha DY, Wambi CO, Ou YC, Yuh B, Park S, Llukani E, Albala DM, Wilson T, Ahlering T, Badani K, Ahn H, Lee DI, May M, Kim WJ, Lee DHDetailed Analysis of Prostate Cancer Patients with Metastasis to the Prostatic Anterior Fat Pad Lymph Nodes: a Multi-Institution Study. J Urol. 2013 Aug;190(2):527-34. Ou YC, Kuan YH, Li JR, Raung SL, Wang CC, Hung YY, Chen CJ. Induction of apoptosis by luteolin involving akt inactivation in human 786-o renal cell carcinoma cells. Evid Based Complement Alternat Med.2013;2013:109105.
van den Eertwegh AJ, Karakiewicz P, Bavbek S, Rha SY, Bracarda S, Bahl A, Ou YC, Kim D, Panneerselvam A, Anak O, Grünwald V. Safety of everolimus by treatment duration in patients with advanced renal cell cancer in an expanded access program. Urology 2013 Jan;81(1):143-9. Li JR, Yang CR, Cheng CL, Ho HC, Chiu KY, Su CK, Chen WM, Wang SS, Chen CS, Yang CK, Ou YC*. Efficacy of a protocol including heparin ointment for treatment of multikinase inhibitor-induced hand-foot skin reactions. Support Care Cancer. 2013 ;21(3):907-11. Ou YC*, Yang CK, Wang J, Hung SW, Cheng CL, Tewari AK, Patel VR.The trifecta outcome in 300 consecutive cases of robotic-assisted laparoscopic radical prostatectomy according to D’Amico risk criteria. Eur J Surg Oncol. 2013 Jan;39(1):107-13. Cheng SH, Wang SS, Lee CH, Ou YC, Cheng CL. Malignant solitary fibrous tumor of the urinary bladder. J Chin Med Assoc.2012 Sep;75(9):479-82. doi: 10.1016/j.jcma.2012.06.021. Epub 2012 Aug 11. Li JR, Cheng CH, Chiu KY, Cheng CL, Yang CR, Ho HC, Ko JL, Ou YC*.Minilaparotomy salvage of malfunctioning catheters in peritoneal dialysis. Perit Dial Int.2013 Jan-Feb;33(1):46-50. Lai CY, Ou YC, Chang CY, Pan HC, Chang CJ, Liao SL, Su HL, Chen CJ. Endothelial Japanese encephalitis virus infection enhances migration and adhesion of leukocytes to brain microvascular endothelia via MEK-dependent expression of ICAM1 and the CINC and RANTES chemokines. J Neurochem.2012 Oct;123(2):250-61. Li JR, Chen CH, Cheng CL, Yang CK, Ou YC*, Ho HC, Yang CR, Wang SS, Chen CS, Ko JL, Chiu KY. Five-year experience of peritoneal dialysis catheter placement. J Chin Med Assoc2012 Jul;75(7):309-13. Li JR, Chen CH, Chiu KY, Yang CR, Cheng CL, Ou YC*, Ko JL, Ho HC. Management of pericannular bleeding after peritoneal dialysis catheter placement. Perit Dial Int.2012 May-Jun;32(3):361-2. Li CC, Lee CH, Jan YJ, Chiu KY, Cheng CL, Yang CR, Ou YC, Ho HC, Hung SW, Li JR. Renal mucinous tubular and spindle cell carcinoma with an aorto-caval mass mimicking metastatic lymphadenopathy. J Chin Med Assoc. 2012 May;75(5):240-2. Chen CC, Ou YC*, Yang CK, Chiu KY, Wang SS, Su CK, Ho HC, Cheng CL, Chen CS, Lee JR, Chen WM. Malfunction of the da Vinci robotic system in urology. Int J Urol. 2012 Aug;19(8):736-40. Chen CS, Wang SS, Li JR, Cheng CL, Yang CR, Chen WM, Ou YC, Ho HC, Chiu KY, Yang CK. PSA density as a better predictor of prostate cancer than percent-free PSA in a repeat biopsy. J Chin Med Assoc. 2011 Dec;74(12):552-5. Chen CJ, Ou YC, Chang CY, Pan HC, Liao SL, Chen SY, Raung SL, Lai CY. Glutamate released by Japanese encephalitis virus-infected microglia involves TNF-α signaling and contributes to neuronal death. Glia. 2012 Mar;60(3):487-501. Rini BI, Escudier B, Tomczak P, Kaprin A, Szczylik C, Hutson TE, Michaelson MD, Gorbunova VA, Gore ME, Rusakov IG, Negrier S, Ou YC, Castellano D, Lim HY, Uemura H, Tarazi J, Cella D, Chen C, Rosbrook B, Kim S, Motzer RJ. Comparative effectiveness of axitinib versus sorafenib in advanced renal cell carcinoma (AXIS): a randomised phase 3 trial. Lancet. 2011 Dec 3;378(9807):1931-9. Li CC, Li JR, Huang LH, Hung SW, Yang CK, Wang SS, Chen CS, Ou YC, Ho HC, Su CK, Chen WM, Cheng CL, Yang CR, Chiu KY. Metallic stent in the treatment of ureteral obstruction: experience of single institute. J Chin Med Assoc. 2011 Oct;74(10):460-3. Jungle Chi-Hsiang Wu, Yen-Chuan Ou*. Inguinal hernia after radical prostatectomy for localized prostate cancer. Urological Science 2012, 23: 1-4. (Corresponding author). Jungle Chi-Hsiang Wu, Yen-Chuan Ou*, Hurng-Sheng Wu ,Chen-Li Cheng, Chi-Rei Yang, Mao-Sheng Lin. Inguinal hernias in robotic-assisted laparoscopic radical prostatectomy: A surgeon’s experience Formosan Journal of Surgery (2011) 44, 141-145 (Corresponding author). Yen-Chuan Ou*,Chi-Rei Yang, John Wang , Chen-Li Cheng , Vipul R Patel. Yen-Chuan Ou*, Chi-Rei Yang, Chun-Kuang Yang, Chen-Li Cheng, Ashok K Hemal. Simultaneous Robot-Assisted Nephroureterectomy and Cystectomy in Uremic Patients with Multifocal Urothelial Carcinoma. Journal of Endourology. 2011, 25(6): 979–984. Yen-Chuan Ou, Chi-Rei Yang, John Wang, Chun-Kuang Yang, Chen-Li Cheng, Vipul R. Patel, Ashutosh K Tewari. The learning curve for reducing complications of robotic-assisted radical prostatectomy by a single surgeon. BJU Int. 2011; 108(3):420-5. SCI IF: 3.19. Li JR, Yang CR, Wang J, Ou YC, Ho HC, Cheng CL. Unsuspected prostate cancer after cystoprostatectomy: a comparison between two periods in Taiwan. J Formos Med Assoc. 2009 May;108(5):409-13. Ou YC, Yang CR, Wang J, Cheng CL, Patel VR Comparison of Robotic- Assisted versus Retropubic Radical Prostatectomy Performed by a Single Surgeon. Anticancer Research 2009, 29:1637-42. Ou YC, Yang CR, Wang J, Cheng CL, Patel VR. Robotic-assisted radical prostatectomy by a single surgeon in Taiwan: Experience with the initial 30 cases. J Robotic Surg 2008, 2: 173-9. Yen-Chuan Ou, Chi-Rei Yang, Chen-Li Cheng : Robotic-assisted Laparoscopic Radical Prostatectomy: Current Status and Single Surgeon Experience in Taichung Veterans General Hospital. J UROL ROC 2008;19:40-45.
renal epithelial cells. Biochemical pharmacology 2009 Mar 13;380(3):531-6. Pan HC, Kao TK, Ou YC , Yang DY, Yen YJ, Wang CC, Chuang YH, Liao SL, Raung SL, Wu CW, Chiang AN, Chen CJ*. 2008. Protective effect of docosahexaenoic acid against brain injury in ischemic rats. J. Nutr. Biochem. 2009 J Nutr Biochem. 2009 Sep;20(9):715-25. Li JR, Yang CR, Cheng CL, Ho HC, Chiu KY, Su CK, Chen WM, Ou YC: Partial nephrectomy in the treatment of localized renal cell carcinoma: experience of Taichung Veterans General Hospital. J Chin Med Assoc 2007;70:281-285. Chou HP, Ou YC, Cheng CL, Yang CR: Mixed epithelial and stromal tumor of the kidney. J Chin Med Assoc 2006;69:140-142. Ou YC*, Gardner TA, Kao C, Zhau HE, Chung LW: A potential for tissue restrictive gene therapy in renal cell carcinoma using MN/CA IX promoter. Anticancer Res 2005;25:881-886. Chi-Ping Huang, Hao-Chung Ho, Chung-Kuang Su, Ou YC , Chen-Li Cheng, Chi-Rei Yang. Successful kidney transplantation using paired cadaver kidneys procured from a 6-month-old brain death infant. JTUA 2005: 16: 120-123. Hsui-Ming Lin, Ou YC*, Chi-Rei Yang. Metachronous solitary contralateral adrenal metastasis of renal cell carcinoma: case report and literature review. JTUA 2004, 15: 123-6. Su CK, Yang CR, Horng YY, Kao YL, Ho HC, Ou YC, Cheng CL: NMP22 in transitional cell carcinoma of the urinary bladder. J Chin Med Assoc 2003;66:294-298. Ou YC*, Yang CR, Ho HC, Cheng CL, Kao YL, Su CK, Chiu KY, Chen WM: The symptoms of renal cell carcinoma related to patients’ survival. J Chin Med Assoc 2003;66:537-543. Chen WM, Yang CR, Ou YC, Cheng CL, Kao YL, Ho HC, Su CK, Chiu KY, Chen JT: Clinical outcome of patients with stage T1a prostate cancer. J Chin Med Assoc 2003;66:236-240. Li JR, Yang CR,Chen JJ, Ou YC*. Metanephric Adenoma of the Kidney Mid Taiwan J Med 2003,8(4): 247-52. Wen-Ming Chen, Chi-Rei Yang, Chen-Li Cheng, Ou YC, Hao-Chung Ho. Vesical Endometriosis: A case report. JTUA 2003, 14:183-6. Chuan-Shu Chen, Chung-Kuang Su, Kun-Yuan Chiu, Ou YC, Hao-Chung HO, Chen-Li Cheng, Wen-Ming Chen, Chi-Rei Yang. Hand-assisted laparoscopic live donor nephrectomy versus the conventional open approach. Formos J Surg 2003; 36: 268-273. Kao YL, Ou YC , Yang CR, Ho HC, Su CK, Shu KH: Transitional cell carcinoma in renal transplant recipients. World J Surg 2003;27:912-916. Yang CR, Ou YC*, Horng YY, Lee HS: The variation of percent free prostate-specific antigen determined by two different assays. Anticancer Res 2003;23:707-711. Wu YS, Ou YC, Ton YP, Hu C, Ton YL: Multiple epidermoid cysts arising in a cryptorchid testis following ochiopexy. Zhonghua Yi Xue Za Zhi (Taipei) 2002;65:124-126. Ou YC*, Ho HC, Cheng CL, Ka YL, Lin CH, Yang CR: The role of lymphadenectomy in the radical nephrectomy for renal cell carcinoma. Zhonghua Yi Xue Za Zhi (Taipei) 2001;64:215-222. Chiu KY, Ho HC, Chen JT, Kao YL, Ou YC, Cheng CL, Yang CR: Renal cell carcinoma metastasized to the ureteral stump. Zhonghua Yi Xue Za Zhi (Taipei) 2001;64:64-68. Ou YC*, Jung-Ta Chen, Yu-Ye Horng, Chi-Rei Yang. Expression of p53 and bcl-2 in renal cell carcinoma. Mid Taiwan J Med 2001; 6:14-21. Chia-Hsiang Lin, Allen W Chiu, Hao-Chung Ho, Ou YC, Chen-Li Cheng, Hurng-Sheng Wu, Chi-Rei Yang. Minimally invasive surgery for adrenalectomy: Initial experience in Taichung Veterans General Hospital. J Urol ROC 2000; 11: 120-5. 1Hao-Chung Ho, Chi-Rei Yang, Ou YC, Chen-Li Cheng, Yu-Lin Kao, Chia-Hsiang Lin, Chung-Kuang Su, Kun-Yuan Chiu. Orthotopic Neobladder (Studer pouch) after Radical Cystoprostatectomy: Experience in Taichung Veterans General Hospital. J Urol ROC 2000; 11: 114-9. Jia-Lung Kuo, Yu-Lin Kao, Chi-Rei Yang, Chen-Li Cheng,Ou YC*. Transitional cell carcinoma of native kidney and urinary bladder with metastasis to graft kidney: report of a case. Mid Taiwan J Med 2000; 5: 264-9. Chung-Kuang Su, Yu-Lin Kao, Jung-Ta Chen*, Jia-Shiarhng Lin, Horng-Wen Shih, Hao-Chung Ho, Ou YC , Chen-Li Cheng, Chi-Rie Yang. Pheochromocytoma of Urinary Bladder: A case report. Formosan J Surg 2000;33:178-182. Wen-Ming Chen, Chi-Rei Yang, Fan-Chung Lee*, Jia-Shiarng Lin, Horng-Wen Shih, Yu-Lin Kao, Hau-Chung Ho, Ou YC , Chen-Li Cheng, Jung-Ta Chen**. Removal of renal cell carcinoma extending into supradiaphragmatic inferior vena cava using cardiopulmonary bypass with deep hypothermic circulatory arrest V a report of 2 cases. J Urol ROC Vol. 10, No. 4, Dec 1999, p173-176. Chung-Kuang Su, Yu-Lin Kao, Ou YC , Hau-Chung Ho, Chen-Li Cheng, Horng-Wen Shih, Jia-Shiarhng Lin, Chi-Rie Yang. Congenital renal arteriovenous malformation V 3 cases report. J UROL ROC Vol.9 No.1, March 1999, p37-41. Yu-Lin Kao, Chi-Rie Yang, Chen-Li Cheng, Ou YC, Hau-Chung Ho, Horng-Wen Shih. The experience of combination of chemotheraph and surgery in treatment of advanced nonseminomatous germ cell tumor of the testis. J UROL ROC Vol.9 No.1, March 1999, p1-6. Chi-Rei Yang, Ou YC , Hao-Chung Ho, Yu-Lin Kao, Chen-Li Cheng, Jung-Ta Chen, Lai-Ping Chen and William l. Ho. Unsuspected prostate carcinoma and prostatic intraepithelial neoplasm in Taiwanese patients undergoing cystoprostatectomy. Molecular Urology 1999, Vol. 3, No. 1, p33-39. Ou YC*, Chi-Rei Yang, Jehn-Hwa Kuo, Yu-Lin Kao, Chen-Li Cheng. Incidental renal cell carcinoma: pathologic features and survival rate. Chin Med J (Taipei) 1998; 61: 71-76. Ou YC*, Jung-Ta Chen1, Chi-Rei Yang, Yu-Ye Horng, Yu-Lin Kao, Chen-Li Cheng. Tumor angiogenesis and metastasis: Correlation in invasive renal cell carcinoma. Chin Med J (Taipei) 1998; 61: 441-447. Jia-Shiarhng Lin, Chen-Li Cheng, Ou YC, Yu-Lin Kao, Chen-Li Cheng. Recurrence and progression of stage T1 superficial bladder cancer. J. Urol ROC Vol.9 No.1, Mar. 1998, p1-6. Horng-Wen Shih, Chao-Hsiang Chang*, Ou YC, Yu-Lin Kao, Jehn-Hwa Kuo, Chen-Li Cheng, Chi-Rei Yang. Pregnancy following renal transplantation. J. Urol ROC Vol.8 No.3, Sep. 1997, p131-134. Chi-Rei Yang, Ou YC, Jehn-Hwa Kuo, Yu-Lin Kao, Chen-Li Cheng, Sheau-Yun Yean, Yu-Ye Horng, Chung-Shi Yang*. Intracellular glutathione content of urothelial cancer in correlation to chemotherapy response. Cancer Letter. 118: 1-6, 1997. Horng-Wen Shih, Ou YC, Chao-Hsiang Chang*, Yu-Lin Kao, Jehn-Hwa Kuo, Chen-Li Cheng, Chi-Rei Yang, Jong-Da Lia#. Experiences of Graft Nephrectomy. J. Urol ROC Vol.8 No.2, June, 1997, p73-77. Sung-Lang Chen, Ou YC , Chi-Rei Yang, Jung-Ta Chen*, Jehn-Hwa Kuo, Yu-Lin Kao, Chen-Li Cheng. Melanoma in urology: experience and review of literature. J. Urol ROC Vol.8 No.2, June, 1997, p112-115. Sung-Lang Chen, Ou YC, Chi-Rei Yang, Chi-Lung Chang*, Jehn-Hwa Kuo, Yu-Lin Kao, Chen-Li Cheng. Ureteropelvic junction obstruction: comparison of open pyeloplasty and endopyelotomy in 45 patients. J. Urol ROC Vol.8 No.2, June, 1997, p82-86. Ou YC*, Chi-rei Yang, Yuen-Yaw Chang, Jehn-Hwa Kuo, Hsi-Chin Wu. : The clinical experience of gaseous retroperitoneoscopic and gasless retroperitoneoscopy-assisted unroofing of renal cyst. Chin Med J (Taipei) 1997; 59: 232-9. Ou YC* Chi-rei Yang, Chi-lung Chang, Chao-hsiang Chang, Hsi-chin Wu, Hao-chung Ho, Her-shin Lin, Yuen-yaw Chang. Prognostic Factors of Primary Aldosteronism. Chin Med J (Taipei) 1996; 57: 118-23. Ou YC*, Chi-rei Yang, Jehn-Hwa Kuo: comparison between gaseous retroperitoneoscopic and gasless retroperitoneoscopy unroofing of renal cyst. 30th World Congress of the International College of Surgeons. Kyoto (Japan). P 1393-1396, 1996. Yu-lin Kao, Hsi-chin Wu, Chi-rei Yang, Lai-ping Chan*, Chi-lung Chang, Chao-hsiang Chang, Hao-chung Ho, Ou YC, Her-shin Lin and Yuen-yaw Chang. Primary transitional cell carcinoma of the prostate. J Urol ROC Vol. 6, No.2, Jun 1995, p103-107. Ou YC*, Chi-rei Yang, Chi-lung Chang, Thomas I-sheng Hwang, Chao-hsiang Chang, Hsi-chin Wu, Yung-jen Ho, Chia-hung Kao. Comparison of five modalities in localizaztion of primary aldosteronism. Chin Med J (Taipei) 1994; 53: 7-12. Yuen-yaw Chang, Chi-rei Yang, *Ming-jone Tsai, Ou YC, Chi-lung Chang, Chao-hsiang Chang, Hsi-chin Wu, Hao-chung Ho and Jang-kwang Chen. Removal of renal cell carcinoma extending into the right atrium using cardiopulmonary bypass,profound hypothermia and circulatory arrest. Kasohsiung J Med Sci 9:585, 1993. Taong-Po Chen, Thomas I-Sheng Hwang, Cheng-Tsang Yu, Chi-Rei Yang, Chi-Lung Chang, Chao-Hsiang Cheng, Hsi-Chin Wu, Ou YC*. Anaigesic effect of tramadol HCL in ESWL. Chin Med J (Taipei) 1993; 51:134-7. Ou YC*, Thomas I-Sheng Hwang, Chi-Rei Yang, Chi-Lung Chang, Chao-Hsiang Chang and Hsi-Chin Wu. Use of indomethacin in the prophylaxis of ureteral colic following extracorporeal shock wave lithotripsy. Scand J Urol Nephrol 26: 351-355; 1992. Ou YC*, Chi-Rei Yang, Min-Chen Chang, Hsi-Chin Wu, Chi-Lung Chang, Thomas I-Sheng Hwang, Chao-Hsiang Chang. A comparison of transrectal fine needle aspiration and biopsy of prostatic lesion. Chin Med J. 1992, 50: 46-51. Ou YC*, Chao-Hsiang Chang, Chi-Rei Yang, Chi-Lung Chang, Thomas I-Sheng Hwang, Hsi-Chin Wu: Anterior extravesical ureteroneocystostomy in kidney transplantationXa preliminary report. J Surg Assoc ROC 1991; 24: 906-9. Ho HC, Wu HC, Yang CR, Chang CL, Hwang TIS, Chang CH, Ou YC, Liu TJ. Primary retroperitoneal sarcoma — A report of 16 cases. Kaohsiung J. Med. Sci. 7 (8): 443-7, 1991. Ou YC*, Hwang TIS, Yang CR, Chang CL, Chang CH, Wu HC. Use of indomethacin in the prophylaxis of ureteral colic following extracorporeal shock wave lithotripsy. Scand J. Nephrol 26:351-355, 1992. Chiung-chyi Shen, Thomas I-Sheng Hwang, Chi-Rei Yang, Chi-Lung Chang, Chao-Hsiang Chang, Ou YC* and Lai-Ping Chan. Renal oncocytoma: report of two cases and review of literature.Kaohsiung J Med Sci 1991: 7: 435-42. Ho HC, Chang CL, Chu HW, Yang CR, Hwang TIS, Chang CH, Ou YC*. Solitray Schistosomiasis of epididymis. J Urol ROC. Vol.2 No.3, p559-62, 1991. Ou YC*, Hsi-chin Wu, Chi-rei Yang, Chi-lung Chang, Thomas I-sheng Hwang, Chao-hsiang Chang. Renal angiomyolipoma: Experience of 23 patients. Chin Med J 1991, 48:217-23. Ou YC*, Thomas I-sheng Hwang, Chi-rei Yang, Chi-lung Chang, Chao-hsiang Chang, Hsi-chin Wu and Yung-fu Hwang. Hormonal screening in impotent patients. J Formosan Med Assoc. Vol.90 No.6, p560-4, 1991. Ou YC*, Chi-lung Chang, Chi-rei Yang, Thomas I-sheng Hwang, Chao-hsiang Chang, and Hsi-chin Wu: Ureterocele- a clinical analysis of twenty adults. J Surg Asso ROC 1990; 23: 175-179. Ou YC*, Chang CH, Yang CR, Chang CL, Hwang TIS, Wu HC. Surgical management of primary aldosteronism, experience of 9 cases. J. Surg. Assoc. ROC. 22 (6) : 500-505, 1989. Ou YC*, Jenn-Peng Chen, Tse-Jia Liu, Cheng-Chung Wu, Tain-Cheng Wu and Mei-Du Yang. Internal herniation through the greater omentum – a case report. J Surg Assoc ROC 1989; 22: 137-6. Ou YC*, Dar-Yu Yang, Guang-Shiung Chang: Ossification within a thoracic neurilemoma- a case report. Chin Med J (Taipei) 1988; 42: 143-6.